Following over two decades of development, during which it focused on filling orders for foreign markets, Vietnam’s wood sector has come into its own and is now aiming to become a global furniture hub. According to Huynh Van Hanh, Vice President of the Handicraft and Wood Industry Association of Ho Chi Minh City (HAWA), Ho Chi Minh City is the cradle of the Vietnamese wood processing sector. He said that in the early 1990s, Vietnam exported wood products under brand names of Chinese Taipei and Singaporean companies. Since then, domestic wood companies have studied the market economy, as well as its requirements in terms of product quality and origin of materials. Vietnamese wood products are now exported to Japan, the US and the EU under Vietnamese brands. However, when they exported to the EU and the US, domestic wood companies faced foreign investigations on the origin of the timber used to make their products. Huynh Van Hanh said HAWA advised its member companies to buy timber from countries to which their products would be exported. 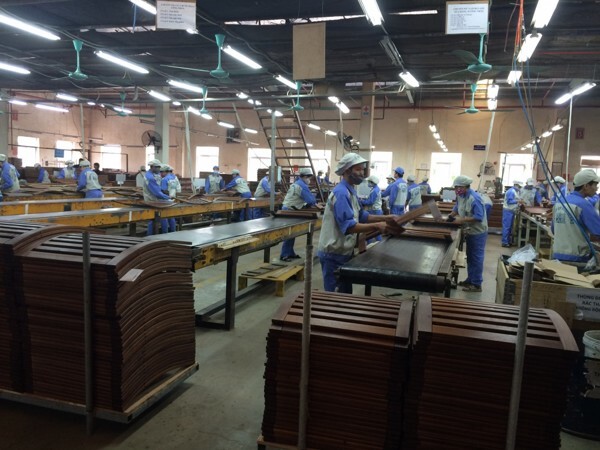 Wood products export has contributed significantly to Vietnam’s gross domestic product (GDP). The export value of wood products increased from US$220 million in 2000 to more than US$9.3 billion in 2018, which was 15.9 percent higher compared with 2017. Currently, wood products rank among the top six Vietnamese export goods, with annual growth of 16.6 percent. According to Pham Phu Ngoc Trai, founder and chairman of the Global Integration Business Consultants Company Limited (GIBC), made-in-Vietnam furniture is available worldwide, and domestic wood companies have supplied products for international, high-end projects. Vietnam is pursuing the goal of becoming a global furniture center. Pham Phu Ngoc Trai believes Vietnam has advantages to develop a strong wood industry based on five core values: product, technology, design, brand and sustainability. However, to achieve the goal, the domestic wood processing sector needs a focused strategy. “We need a development strategy with a long-term vision to turn Vietnam into a global furniture center. The state’s guidance is very important during the initial period of implementation,” Pham Phu Ngoc Trai said. In Huynh Van Hanh’s view, as the world’s fifth largest wood product exporter, Vietnam needs an exhibition center to introduce wood products to both foreign and domestic customers. In his opinion, the state should establish an international commercial distribution center that will serve as a furniture product and material wholesale market where businesses can set up trade connections to promote domestic sales and exports. Pham Phu Ngoc Trai believes that in order to become a global furniture center, Vietnam also needs to improve its support industries to enhance its timber production capacity - the most important stage in the wood sector chain. Over more than two decades, domestic wood businesses have built a closed production model covering all stages of finished wood products: planting forest trees, logging, processing, design and production.